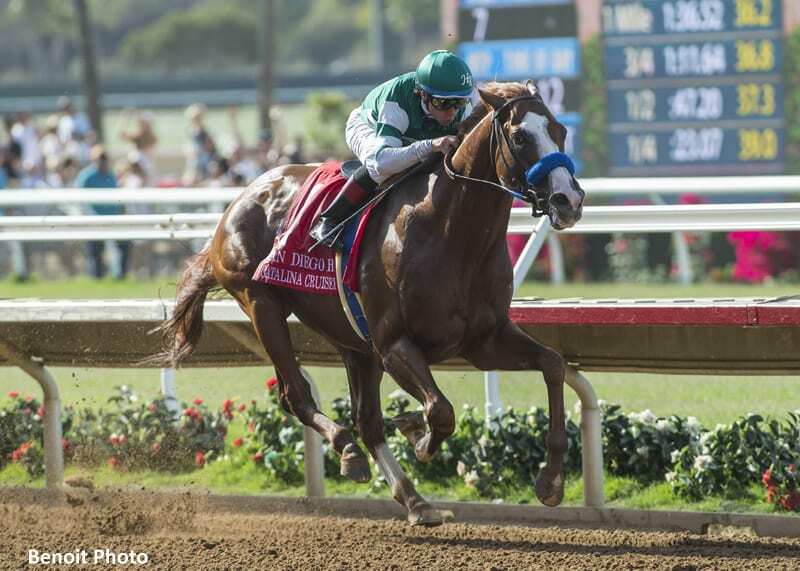 Scratched down to a field of five on Saturday, the G2 San Diego Handicap at Del Mar nevertheless saw a strong performance from Hronis Racing's Catalina Cruiser. The 4-year-old Union Rags colt led throughout for trainer John Sadler, crossing the wire 6 3/4 lengths ahead of his nearest rival. Off as the 6-5 favorite under jockey Drayden Van Duke, Catalina Cruiser covered 1 1/16 miles over the fast main track in 1:42.95. The expected morning-line favorite, Accelerate, owned and trained by the same connections as the winner, was scratched in favor of a possible next start on the east coast. Catalina Cruiser took command shortly after the start of the mile and one-sixteenth race, rated comfortably on the lead and drew off impressively when asked in the stretch, scoring by six and three-quarter lengths. Dr. Dorr, who pressed the pace throughout, held second, a length and three-quarters in front of Dabster, with Two Thirty Five fourth in the field of five older Thoroughbreds. Harlan Punch completed the field. Bred in Kentucky by W.S. Farish, Catalina Cruiser was a $370,000 yearling purchase at the Keeneland September sale. Undefeated in three career starts, the colt has earned $183,600. The winner returned $4.60, $2.80 and $2.40. He carried 115 pounds. Runner-up Dr. Dorr paid $3.40 and $2.60, while Dabster returned $2.60 to show. The San Diego Handicap is the major steppingstone to the Grade I $1 million TVG Pacific Classic which will be run Saturday, August 18 at a mile and one-quarter. This entry was posted in NL Article, Racing and tagged accelerate, catalina cruiser, Del Mar, del mar thoroughbred club, drayden van dyke, hronis racing, john sadler, Keeneland September, San Diego Handicap, Union Rags by Paulick Report Staff. Bookmark the permalink.